Showcase the love you share with your significant other with the stunning and sophisticated Windsor wedding invitation. 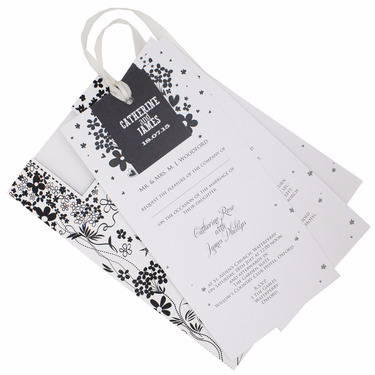 This tall, slim, wallet style invitation features a wonderfully intricate and love-filled design, perfectly showcased in black and white for the ultimate visual impact! Two delightful lovebirds take centre stage on this stylish invitation by Paper Themes as they float through the air declaring their love and admiration for one another, their wings outstretched to symbolise a loving embrace. Surrounded by cute little hearts of varying sizes and a sea of flowers, the attention to detail in this invitation is second to none. Perfect for a spring or summer wedding, this beautiful invitation will be sure to have your guests swooning in anticipation for the big day, and we haven’t even opened it up yet! Complete with three stunning inserts, the wedding invitation, guest information card and RSVP card are all professionally printed onto white pearl board to give a lovely shimmery finish. With a matching pearly satin embellishment included at the top to hold it all together, this design has a very luxurious and expensive feel and appearance, without the price tag! It doesn’t stop there though; complimentary envelopes are included with the Windsor wedding invitation, whilst the wonderful design is available in other forms of stationery including Order of the Day cards, Thank You cards, Save The Date cards and place cards, to name but a few! Everything about this invitation shouts elegance and sophistication, especially the stunning handwritten style font that the Bride and Groom’s names are written in on the invitation itself, which we are all totally in love with!